In 1926, the route US 4 now follows was numbered as NE 13. Most of the route was improved, not paved, in 1926, except between Castleton Corners and Fair Haven were it was paved. NE 13 followed US 4's current path, except through White River Junction where it followed Bridge Street and North Main Street, Quechee where it followed Old Quechee Road and River Street, and between Rutland and the New York state line, where it followed what is now VT 4A. By 1928, the road had been renumbered US 4. By 1940, the entire route through Vermont was paved. By 1963, US 4 as realigned to its current route around Quechee. Between 1968 and 1970, US 4 was realigned to its current path and constructed as a limited access highway between West Rutland and Castleton. By 1973, US 4 had been realigned to its current path and constructed as a limited access highway between Castleton and the New York state line. 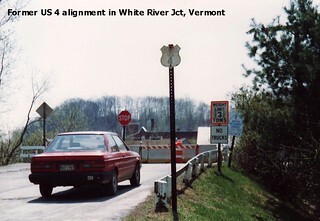 By 1975, US 4 had been realigned to its current path around White River Junction. Between 1980 and 1987, US 4 was rerouted to its current path through Rutland, and rebuilt as a limited access highway to West Rutland.